The trend is down and therefore it is a short position that one must be considering with Lumber if those who are interested have not yet opened such a position. One thing to remember is that with trend following you will not open or close a position at the most optimum price points. The aim is to catch as much as possible of the 'middle part' of the trend. There certainly is a strong trend in Lumber and it is downwards. The short trade is the only trade right now. For those who got in well done. For those who have not then be careful as Lumber is tanking far quicker than the time it took to reach its recent peak. Short trades normally last a shorter period than long trades. The chart below shows that Lumber is clearly below its 20 day, 50 day and 100 day moving averages. 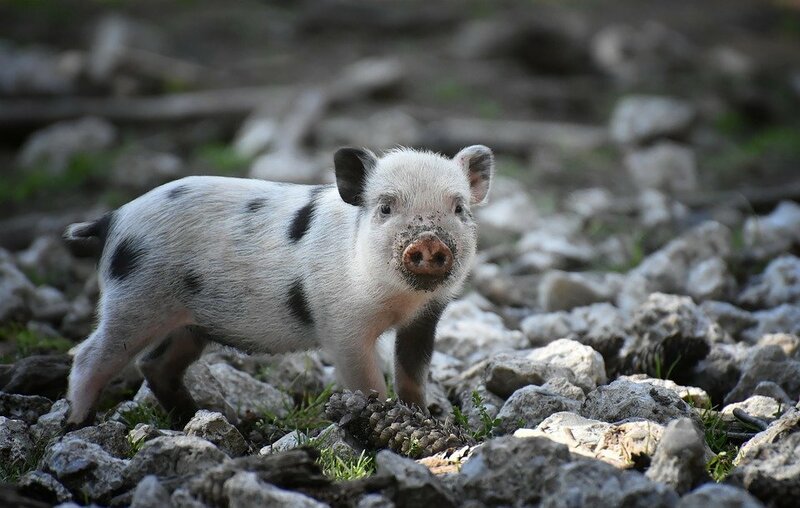 I thought some of you may find this article rather interesting. Lumber is playing out exactly how I had envisaged. I attach a chart below to nicely illustrate this. 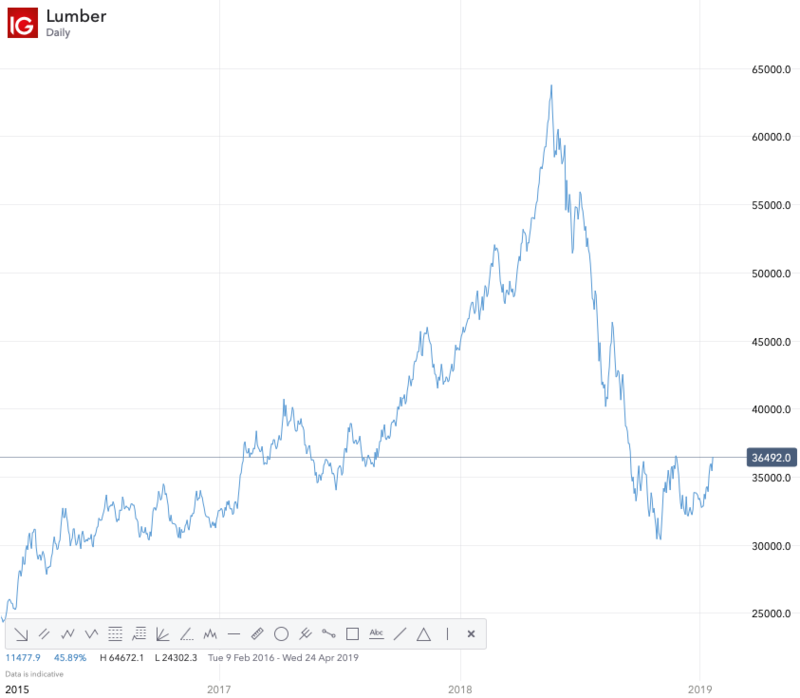 Lumber (Timber) is what I would deem as a more 'defensive asset' which tends to hold its price well during market turmoils. Of course it is not as defensive as cash and fixed interest! Therefore once this downwards pressure is over and it will then I can easily see another couple of years of Lumber prices slowly rising. This is when one must think about a long term trade in Lumber and just 'letting it ride'. However, one must wait for the downward move to conclude and then wait for a clear trend reversal to enter. For now the only trade is short on Lumber so for those of you holding well done. Lumber seems to be going through a consolidation phase. It is holding up rather well. The chart below highlights this point. I shall be keeping a close eye on the price action of Lumber. The Lumber price action is starting to get very interesting. It is slowly creeping upwards. It is not making the headlines or making any noises but it is my 'Silent Assassin' when it comes to a trade. It is not the 'sexiest' of Commodities but it was one of my best performing trades of recent times both on the 'long' and 'short' trades. Lumber is one of my favourite commodity trades over the past couple of years and it is starting 2019 rather well. The 'daily' chart is looking exciting! No seriously the Lumber trends are special if you can get an opportunity to ride them. Stunning performance from one of my favourite commodities of the past couple of years - Lumber. It is up 1166 points at the time of writing this post. The chart is trying to show a 'rocket' taking off! Q: what are your preferrences for line over candle charts? One must know their audience. For professional traders who are experienced it does not matter whether I post line or candle charts as they will pay little attention to my charts. For new and inexperienced traders one must keep things as simple as possible and try and articulate matters in plain simple English including charts. I get many contacting me using IG's messaging service so I understand and appreciate my followers and those who read my posts. Therefore I deliberately keep things simple and my charts are no different. I get a lot of positive feedback from new and inexperienced traders who prefer and enjoy my simpler to follow posts. So I am catering for the audience that read my threads and posts. 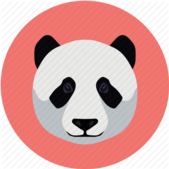 Line graphs present less information than candle charts so it depends on what type of trader you are as to which you decide to use and which you prefer. It is a personal choice but one that will be derived from your trading style and strategy. I find that line charts are a lot simpler and removes all the 'clutter' and 'noise' from the charts some of which can confuse you and not necessarily make it any easier for you to trade effectively or profitably. I tend to use a 'daily' timeframe when I trade trends and my position is held for as long as there is a trend. Therefore for me I do not need to see all intricate details which can be seen on candle charts. As a higher timeframe trader I prefer line charts as I want to look at a chart and get a sense of direction of the trend. I will switch and look at different timeframes but my 'default' is the 'daily'. I think more shorter time frame traders may prefer or have a use for candle charts. I find that the line chart provides a more clearer and visually simpler picture but that is just my personal preference. I think day traders may prefer candle charts but each to their own. Lumber finished yesterday at around 40300 level. The trend is your friend as they say! The trend is getting stronger and stronger and momentum is really building. The price action is upward and sharp. Lumber up another 1500+ points today. candlestick works for me. Seems to give a whole load more info and when you scroll out to see a larger time frame it naturally going to a line anyway. The question now is can Lumber after any anticipated pullback continue upwards? I do not know the answer but the price action will certainly tell us going forwards. Lumber is looking to resume it upward trajectory and is setting itself up nicely from the charts for its next move upwards. 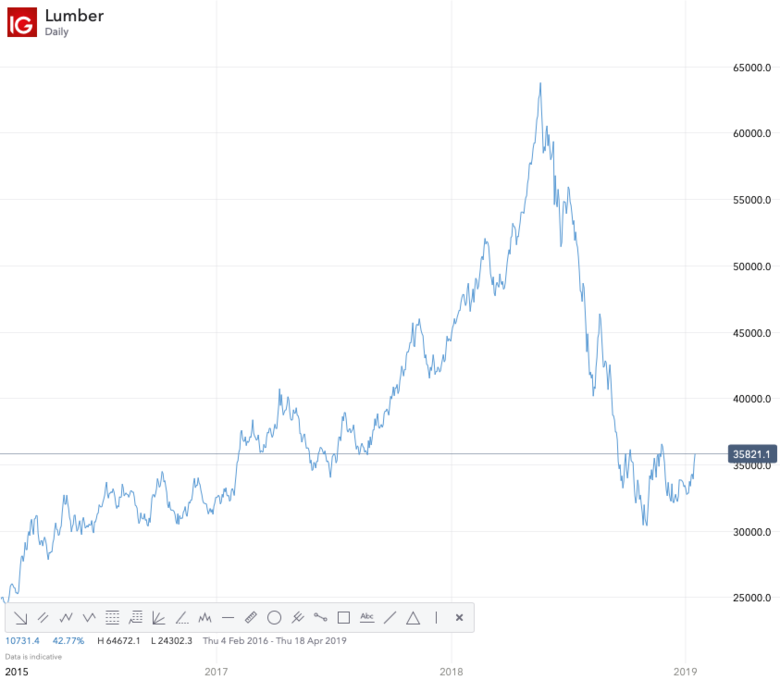 Is Lumber actually continuing it downward move? Lumber could either continue downwards or simple correct and continue moving upwards. It is hard to tell at this moment in time. Lumber is generally perceived as a defensive asset. It does better than other assets when markets are tumbling downwards. If house constructions are increasing then this will increase the demand for Lumber and thus leading to a higher price. Right now with potential recessions which could be faced by certain large economies around the world and political uncertainty it seems Lumber is confused and at crossroads. Lumber is showing very sharp rises and sharp drops. This is why when trend following commodities and trying to catch that big trend (there will be plenty of losses) then having more wider stop losses is crucial (at the same time keeping losses to a minimum - very difficult art). If stop losses are too tight then volatility will merely stop you out you will never be able to ride the trend either upwards and downwards. Yes there is a big risk of making larger losses than if you had tighter stop losses but that is the nature of trend following hence why it is not for everyone. One must have capital, wider stop losses within their risk management strategy and be prepared to have more losing trades than winning trades. The key metric is that the profits on the winning trades are larger than the losses on the losing trades. If you cannot stomach the above then trend following may not be for you and there may be other trading principles and philosophies you can adopt such as day trading, scalping, swing trading, etc. Lumber has just delivered over 1500 points today and up just over 4%. It seems to getting ready for the next leg up. Lumber is a more defensive asset though I do sometimes wonder with the returns I have made on Lumber both on the long and short trades. Lumber is providing traders with big moves up and down which is great for trend followers. 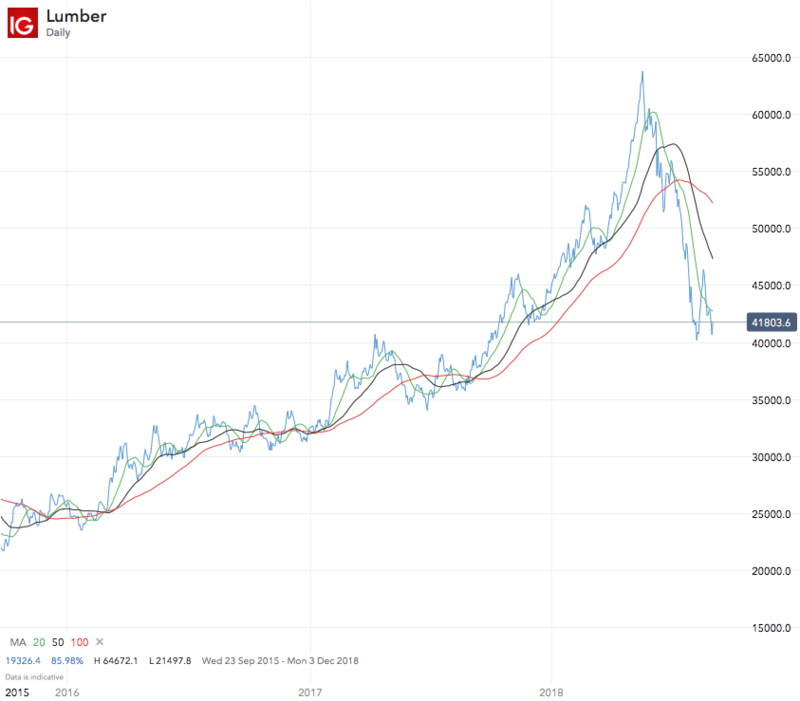 Could Lumber hit that psychological $40000 level again? Lumber is showing another 1500 points up at the time of writing. Lumber has been one of my favourite and most successful trades recently both on the way up and on the way down. If it clears $43647 level then it could attract a lot of long positions. From a fundamental perspective any trade deal between US and China could result in industrial commodities increasing in price and one may expect Lumber to increase too. Having traded Lumber on both the 'long' side and 'short' side in recent times I accept that liquidity can be an issue. Lumber is not one of the most 'sexiest' commodities to trade but it sure has been one of the better trends both long and short. The strength of the trend and momentum was exceptional. Dr. Copper is widely reported in the media and how it can be a good economic barometer. Lumber is my personal opinion is no exception. Lumber prices can be a good indicator for housing construction in the US. When house sales increase, the price of Lumber increases too as a result of Supply and Demand. We all know the pressure the US and Trump are under to increase new housing construction. Also lower interest rates can also inject some further upward movement in Lumber prices. Also one must not forget that the US winter season is nearing an end so US construction should in theory increase which again could lead to an increase in the demand for Lumber and thus rising prices. From a technical perspective, Lumber has shown positive price action in relation to volume over the past four days. This is an encouraging sign. The momentum is not quite as strong as I would like but it could well pick up over the coming days and weeks. The current price is trading above its 20, 50, 100 and 200 DMA. This is also a positive sign. On the flip side is that the moving averages curves for 200 is sloping downwards which indicates it is still in a longer term downtrend. The 20 DMA is showing downwards to sideways activity and the 50 and 100 are showing slightly upward sloping tendencies. 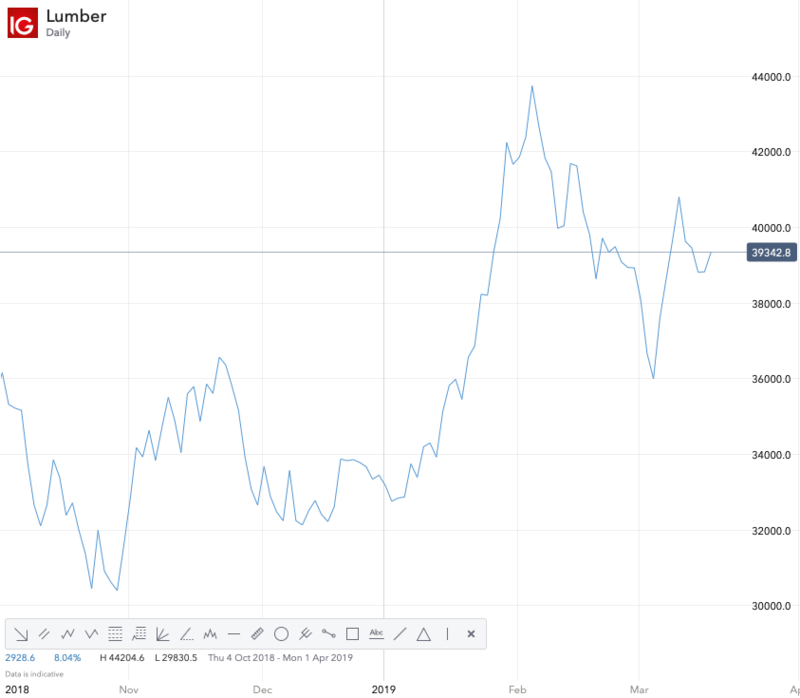 It is still very unclear at this stage which makes any trade in Lumber high risk with so much uncertainty with the US and China trade talks. The price is showing above the Parabolic SAR which is a bullish indicator but can be perceived as meaningless without considering other factors. However for Lumber it can provide a good point when one tries to set stop losses. In my personal opinion, price action is king. 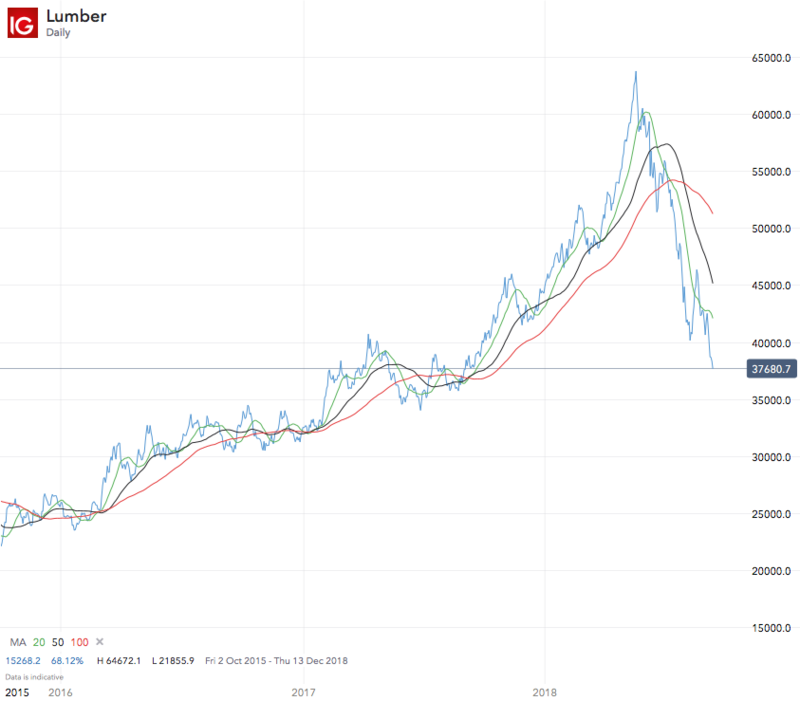 If one can follow the price action of Lumber, live and breathe its daily price behaviour then it helps to really understand what is happening with Lumber can any information and data can be used to make an informed trading decision. In my experience if your stop loss is too tight then the volatility will merely stop you out, such as the large price swings. From a trend following perspective one must set wider stop losses but for this one will need nerves of steel and a large amount of capital. Anything else will make it extremely difficult to take advantage of the points on offer here. Swing trading and Scalping could be effective and day traders could find joy but for me it is all about riding the trend for as long as possible and maximise any returns that are potentially on offer. Lumber is starting to get very interesting. Lumber has failed to either hit or cross that psychological $40000 level. There may be potential support at its 100 DMA. However, it has breached its 20 DMA and 50 DMA and is approaching its 100 DMA. If it went below its 100 DMA then that would present a bearish signal to me. If it can hold above it then it may be a period of consolidation before slowly building back upwards. 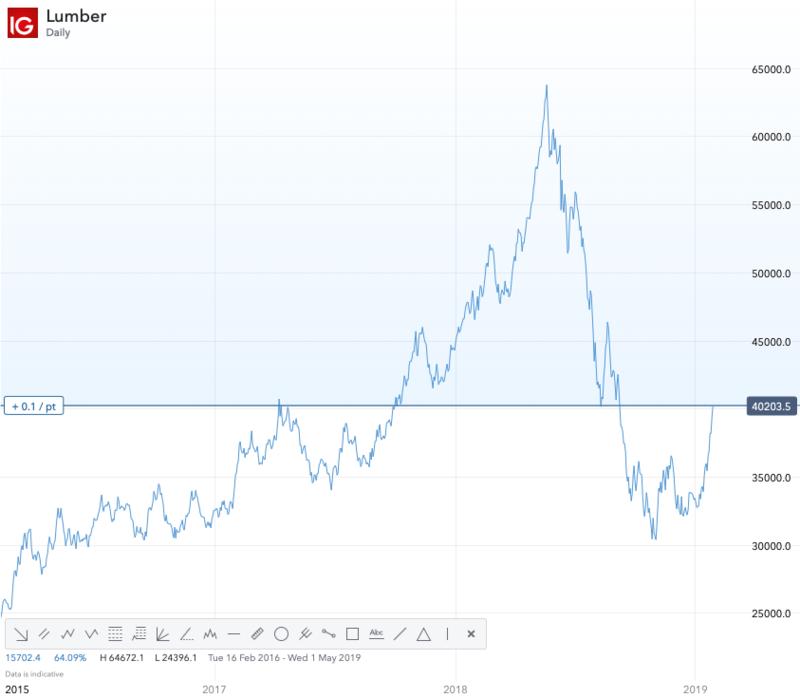 My personal opinion is that one must have a longer time horizon for Lumber as it is a more 'defensive' Commodity that can go down less when Commodities as a whole are going down. It also can do rather well when equities as a whole are doing well as 'house building' is a priority for several major countries with the US being one of them. For those that are interested then they may wish to follow the price action of Lumber. Looking at Lumber then it seems to me that it needs to hold the $30000 level. If it can defend and hold that then there could be further upside this year. If not then it could begin going down into the late $20000's. This is a personal assumption which now will need to be tested based on current price behaviour. In my opinion, for any trend followers who are short, they must hold (even if they do not add to their positions on further price declines) until there is a clear trend reversal. This should execute their stop loss / trailing stop. In my opinion, for any trend followers who are waiting on the sidelines that do not want to short, then they must wait patiently until there is a clear trend reversal signalling / indicating a trend reversal to warrant a long trade initiation. For some of you who missed this or were not aware then this is both an interesting and relevant article in relation to this thread. 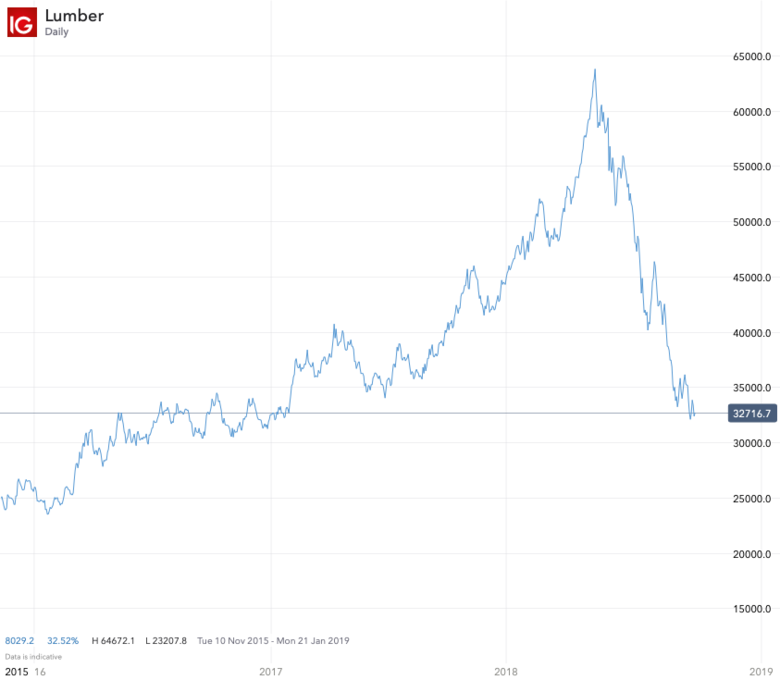 I wanted to take this opportunity to share this chart which shows how a 'Short' trade on Lumber would have been profitable for those traders who had taken such an opportunity over the last 12 months. Are we going to see and experience 'Mean Reversion'? What do people on the IG Community think? I will include the 'Daily' chart zoomed out as much as possible below.